The Old Stone House is a 1933 reconstruction—with some original materials—of the Vechte-Cortelyou House, which was destroyed in 1897. The house, an important part of the 1776 Battle of Brooklyn, is located in JJ Byrne park in the Park Slope neighborhood of Brooklyn, New York. At one point, it was the clubhouse of the Brooklyn Superbas which later became the Brooklyn Dodgers. It was listed on the National Register of Historic Places in 2012. The Old Stone House is a replica, using some unearthed original materials, of a Dutch stone farmhouse originally built adjacent to the current site by the Dutch immigrant Claes Arentson Vechte in 1699. It is also known as the Vechte-Cortelyou House. The Vechte family farmed the lands around the house, harvested oysters in the Gowanus Creek and ferried their produce down the creek to the Gowanus Bay and thence to lower Manhattan. The farmhouse built of brick and stone is the site of the present day J.J. Byrne Memorial Park (formerly Washington Park). It is located at Third Street between Fourth Avenue and Fifth Avenue along where Gowanus Creek used to run. Today, the southeastern branch of the Gowanus Canal ends 1300 feet (400 m) west of the house, near Third Avenue between Third and Sixth streets. 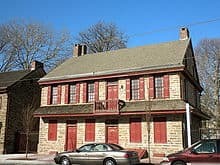 On August 27, 1776, the house was an important location in the Battle of Brooklyn during the American Revolutionary War – the first major engagement of the Continental Army after the Declaration of Independence, and the largest battle of the entire war. On that day at 9:00 am, George Washington arrived from Manhattan. having been informed that the British were close to a breakthrough of American lines. Washington realized that he had been completely fooled by a deceptive feint by the British on Long Island and he ordered more troops to Brooklyn from Manhattan. On the American right, to the west, Colonial General Stirling still held the line against Grant. Stirling held on for four hours, still unaware of the British flanking maneuver to his east, and some of his own troops thought they were winning the day because the British had been unable to take their position. This was intentional by the British. At 11:00 am, however, British General Grant, reinforced by 2,000 Royal marines, hit Stirling’s center and Stirling was attacked on his left by the Hessians. Stirling pulled back but British troops were, at this point, coming at him in his rear south down the Gowanus Road. The only escape route left was across a Brouwer’ Millpond on the Gowanus Creek which was 80 yards wide, on the other side of which was Brooklyn Heights. 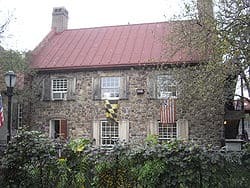 Nicholas Vechte, grandson of Claes, lived in the Old Stone House during the American Revolutionary War under the British occupation. Upon his death in 1779, the farm he willed to his grandson, Nicholas R. Cowenhoven. In 1797, Cowenhoven sold the house to Jacques Cortelyou, who purchased it for the use of his newly married son, Peter. Peter’s son Jacques inherited the house in 1815. His family was the last to live in the Old Stone House. After the death of his wife Jacques Cortelyou sold the property to Edwin Litchfield, a railroad developer, in 1852. Litchfield lived in Litchfield Villa, now the Brooklyn headquarters of the New York City Department of Parks and Recreation. 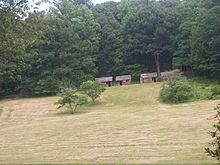 Litchfield was the major landowner of the farmland in the area at that time and sold much of his land to the city for the creation of Prospect Park. After the Litchfield purchase The Old Stone House remained standing another forty years and was occupied by a caretaker during that period. It also served as a club house for the professional baseball team called the Brooklyn Superbas, which would later be known as the Brooklyn Dodgers before their move to Ebbets Field. The Old Stone House was across the street from Washington Park, one of the oldest professional-baseball stadiums in New York. A wall from Washington Park is still visible on Third Avenue between First and Third Streets. The land that the house was on was purchased by the New York City Parks Department in 1923 and the house, which had been razed and burned in 1897, was excavated in 1933. Half of the house was below street level when the level of Fourth Avenue had been graded up at the end of the nineteenth century. The house was reconstructed in 1934 using many of the original stones, though it was moved slightly from its original location. It underwent additional restoration in the 1970s and 1990s. 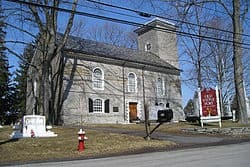 Today the Old Stone House Historic Interpretive Center is operated by the Old Stone House of Brooklyn (OSH), a not-for-profit corporation, under license from the New York City Department of Parks & Recreation. In addition to an exhibit on the battle, OSH offers a full program of school visits on subjects related to the history of the house and the battle and an extensive schedules of concerts, readings, lectures and other events.